23 posts are filed under this symbol. November 16, 2007 59 Comments AMCC, CSCO, EQIX, FNSR, GOOG, JAVA, JNPR, NETL, VTSS.PK. It is our opinion that Google (GOOG) has designed and deployed home-grown 10GbE switches as part of a secret internal initiative that was launched when it realized commercial options couldn’t meet the cost and power consumption targets required for their data centers. This decision by Google, while small in terms of units purchased, is enormous in terms of the disruptive impact it should have on 10GbE switching equipment providers and their component supply chains. It is as if a MACHO just arrived in the Enterprise networking business and the orbits of the existing satellites have begun to shift without observers knowing why – until now. September 4, 2007 5 Comments GOOG. A magician is successful by making the audience focus on one hand while the other engages in hidden behavior. Google’s (GOOG) proclamations that it is not evil are corporate PR sleight of hand, and should raise, not lower, the awareness of users of the ways it might indeed be evil. This weeks Economist leads with a cover story and editorial that eloquently frames our concerns. 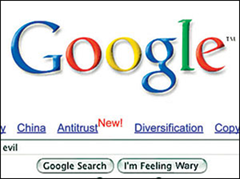 June 26, 2007 7 Comments CMCSA, GOOG, MSFT, T, VG, VZ, YHOO. Google (GOOG) appears to be buying GrandCentral, a company that merges VoIP and advanced calling features. They provide you with a single phone number and web/mobile interfaces to manage call redirection, voicemail, address books, etc. Think of it as VoIP on steroids and EPO, simultaneously. Click over to their Features page for a better description and familiarize yourself with how outdated a plain landline has become. Who Pays for the Online Video Boom? February 5, 2007 16 Comments AKAM, CMCSA, CVC, GOOG, T, TWC, VZ. Everyone talks about the explosion in Video traffic. Everyone talks about the explosion in the bandwidth required to carry it. No one talks about who is going to pay for it. There is one likely source: transit bandwidth inflation. December 20, 2006 1 Comment BLS, GOOG, T, YHOO. It’s pretty clear that the AT&T (T ) and Bellsouth (BLS) merger has turned into a proxy war over Net Neutrality, with Yahoo (YHOO) and Google (GOOG) spearheading the effort in a naked attempt to keep their distribution costs near zero. Correspondingly, Washington bloodsuckers lobbyists on both sides are gearing up. November 21, 2006 Post a comment AAPL, CMCSA, CSCO, DELL, GOOG, HPQ, INTC, MSFT, T, VZ. Quick, rank the 10 following companies by market capitalization from large to small. If pressed for time, try picking the three biggest and three smallest. November 7, 2006 Post a comment AKAM, GOOG, MSFT. Gizmodo has a video demonstrating the new Xbox Live Video service which allows Xbox 360 owners to download and watch high definition Movies and Television. I discussed the impact of this announcement earlier. October 30, 2006 13 Comments AKAM, GOOG, MSFT, YHOO. Akamai (AKAM) was an exception in my portfolio. I typically avoid high P/E high market cap companies, but Akamai had a unique and dominant position in the marketplace that I felt people overlooked. But I’ve synthetically hedged out Akamai holdings since September 22.